Officine Panerai continues to attract an impressive swathe of fans and admirers, even though The Watch Snob insists it’s a brand that was little more than a passing fad brought back to popularity by the actor Sylvester Stallone. 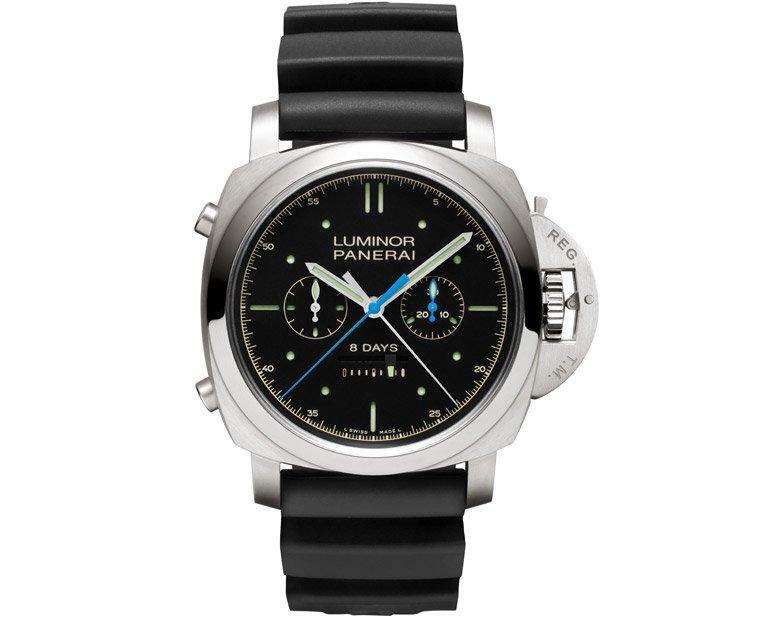 Now the brand presents the new Luminor 1950 Rattrapante 8 Days Titanio, a sophisticated model in which the classic Panerai design is perfectly combined with the technical aspects of high quality sports watchmaking. The Luminor 1950 Rattrapante 8 Days Titanio is a split-seconds chronograph with vertical clutch and twin column wheels, and offers numerous functions associated with top-end watchmaking. The watch is powered by the P.2006 movement, entirely developed in-house at the Officine Panerai manufacture in Neuchâtel. The split-seconds function, also known as rattrapante, operates two hands that are superimposed and partially independent: the first is entirely controlled by the button at 8 o’clock, which starts, stops and resets the chronograph hand; the second, controlled by the button at 10 o’clock, is used for measuring partial times or a second event simultaneous with the first. To make it easier and clearer to read, the hand of the small minute counter moves in jumps instead of continuously. The P.2006 hand-wound movement has an ample power reserve of eight days, a traditional duration for Panerai watches. This is achieved by means of a special patented system of three spring barrels. The remaining power reserve can be read on the dial from a linear indicator above the number six. To enable the watch to be synchronised perfectly with a reference signal, the P.2006 movement also has a seconds reset function, which zeroes the seconds hand by stopping the balance wheel until the winding crown has been returned to the running position. The Luminor 1950 Rattrapante 8 Days Titanio has a brushed titanium case in a traditionally large 47 mm diameter case, fitted with the classic lever device which hermetically seals the winding crown to ensure water-resistance to 10 atmospheres (equivalent to a depth of about 100 metres). On the back of the case, in the centre of the 12-sided caseback, is a sapphire crystal lens through which the elegant finish of the P.2006 movement can be seen. The bezel is made of polished titanium and surrounds a large black dial of great simplicity and sporting elegance. 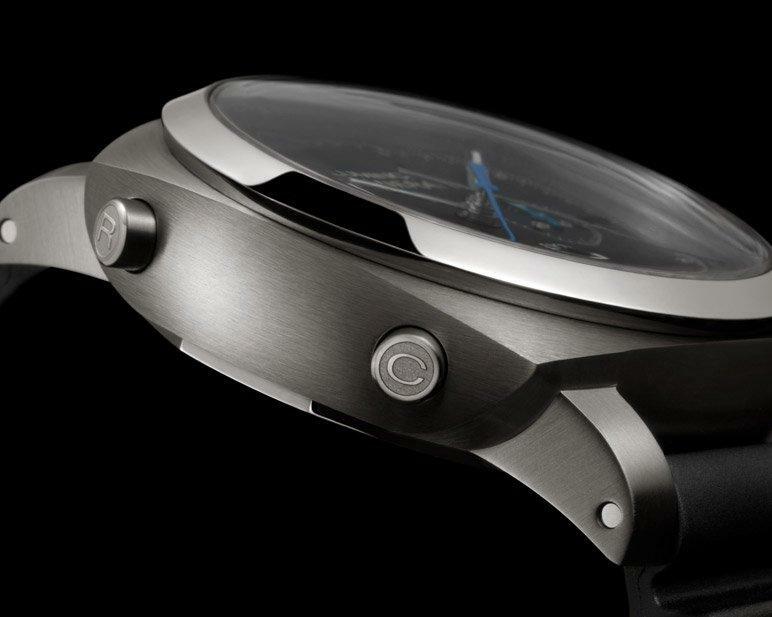 The structure of the dial consists of two superimposed discs with a layer of Super-LumiNova® between them: a type of construction which has been characteristic of Panerai watches since the 1930s, it provides great legibility and visibility even in situations of very low light, such as underwater. 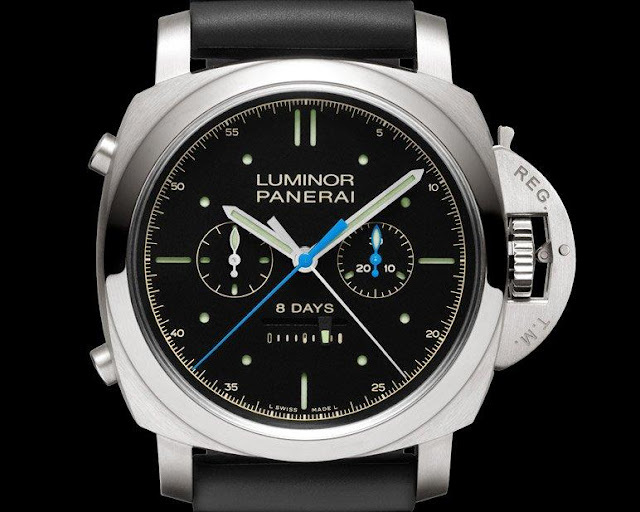 Identified by the reference PAM00530 and produced in a limited edition, the new Luminor 1950 Rattrapante 8 Days Titanio comes on a rubber strap. It is part of the of the Officine Panerai Specialities collection and is destined to be sold out in no time at all. I actually enjoy panerai I've had a few and I've maintained them well and have some of the best watchmakers work on them. SwissWatchLand.com if you want to know.I don't understand why the watch is unappreciated.